My husband, Ron, works with his hands a lot. He’s either doing carpentry or artwork (you can check out a sample of the artwork at http://eastfineart.com/), so he’s constantly dirty-ing, scraping, and drying out his hands. When Atsko sent me a jar of their Pro-Tech-Skin to review, he was thrilled! The product is made entirely from inert waxes that work to provide a natural barrier so that your skins own oils and moisture will be protected, resulting in healthier, faster healing skin. A great alternative to lotion, a little goes a long way and stays on your hands for a long time. Since there are no additives, this is a great product for people prone to allergies and skin irritations. Eczema, lupus, and UV-sensitive sufferers will especially appreciate this product since it is free of chemicals, water, clay, and other fillers. With no added scents (though you may smell the faint memory of honey from the beeswax), it’s also great for people who are sensitive to scents or who work in environments where scents aren’t appropriate. One really only needs a little bit to be rubbed into the hands after washing and drying. At first, it made my hands feel slightly greasy, but nothing rubbed off anywhere and the feeling soon dissipated. Working as a paramedic on the weekend and in human services during the week, I am constantly washing my hands and using hand sanitizer. Not that Pro-Tech-Skin protects you from germs, per say, but with that extra protective barrier, your skin is stronger and thus more resistant to small lesions that are common to people who wash their hands a lot (what do you think dry skin is?). This is especially nice for anyone having to endure harsh elements outside, deal with chemicals or drying agents, and also just as a general protection and nourisher for skin everywhere! This product is very affordable at only $7.30 per jar and should provide about 73.5 applications to the average pair of hands. I’d say that’s pretty good even for a tightwad like myself! The guys over at Atsko also recommended it to me for use on baby bottoms to protect from rashes. I haven’t used it for that yet, but I imagine that it would be very compatible with cloth diapers since it doesn’t contain any of the ingredients that commonly stain and stick to fleece. I am fond enough of this product that I’m actually sitting at work right now wishing I had the jar with me, because as I write, I realize how thirsty my hands are for it! 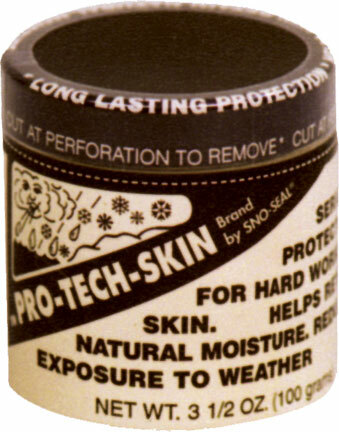 If you care about your hands or anyone else’s, get a jar of Pro-Tech-Skin. Really, it’s an investment worth more than the money. Want to try before you buy? Call Atsko at 800-845-2728 and ask for a free sample (be sure to tell them that you came from Life More Simply’s blog!). Not only is Atsko generously giving out samples, though, they’re also giving a full sized jar to one of my readers! Visit their website at http://www.atsko.com/ and let me know about another product they have that you’d be interested in trying. Be sure to leave me your email address in the comment! Contest ends Sunday, June 21 at 11:59 EST and is only open to US mailing addresses. – If you already earned an extra entry from this post, let me know! I would also like to try the N-O-DOR Pet Shampoo. Thanks for the giveaway! I would like to try Sensi-Clean Laundry Detergent. I'd like to have the no odor pet shampoo for my four legged friends! I could use the N-O-DOR Pet Shampoo for my 2 giant dogs. I would like to try the Sensi-Clean Laundry Detergent for my baby's sensitive skin. The Sensi-Clean Laundry Detergent looks interesting! Thanks for the giveaway!